MVP? Most Improved? Will the Knicks win 10 games? 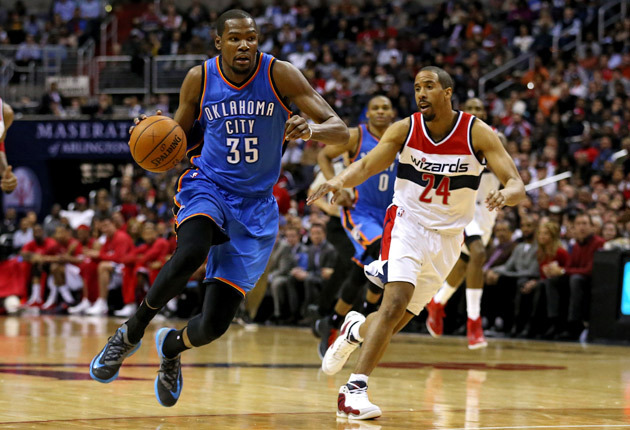 Our NBA experts dish our midseason awards and predictions. With half of the NBA's 2014-15 regular season in the books, SI.com is dishing out midseason awards and predictions. Among the topics: Most Valuable Player, revised Finals picks and random second-half predictions. Harden and Curry are neck and neck. I give Harden a slight edge because he is filling practically every meaningful column on the stat sheet and shouldering his team’s entire offensive burden. He leads the league in scoring, but he’s also playmaking, rebounding and, yes, defending. He’s the model for modern efficiency, living at both the three-point line and the free-throw stripe. Curry has gotten more help from his sidekicks, like Klay Thompson, than Harden has from his, like Dwight Howard. Regardless, this seems to be a year for a new MVP. It’s close, and if the Rockets surge in the second half, Harden, reinvented as a legitimate two-way player, can pass Curry, as can Gasol, whose offensive output has dipped slightly in January. For now hand the hardware to Curry, whose development as a true point guard has made him the NBA’s most dangerous weapon. Hopefully the second half of the MVP race is a little more interesting than the first half. Curry is the runaway winner and his case is bullet-proof. He plays for the league’s best team, he leads the league’s most lethal five-man lineup, and he ranks among the league leaders in all of the important advanced metrics (PER, Win Shares, Real Plus-Minus, Net Rating). He’s a top 10 performer in scoring, three-pointers, assists and steals. Curry’s excellence even extends to raw popularity, as he’s challenging James for the most All-Star votes. This is, without a doubt, Curry’s award to lose and the Warriors show no signs of falling off at the moment. • MORE NBA: Who is No. 1 in Power Rankings at midseason point? Remember when Steve Nash won the MVP based entirely on his offense? Curry is having a Nash-like effect on offense – arguably even greater – and has become a much-better defender, the rare steals guy who doesn’t need to gamble to get them. Harden’s got a great case, but it’s hard to argue with the Warriors’ midseason success. Curry and Harden are almost equally deserving of the midseason MVP for their insane productivity and deep involvement in their respective offenses. I give Curry the edge based on his pervasive influence; Golden State’s star guard might be even more of a threat without the ball than with it, which is saying something considering his impossible shooting efficiency across the field of play. The defense bends with any movement from Curry, opening up passing lanes for a team loaded with playmakers at every position. Then, when Curry is back in control, his snap pull-up jumper and sharp court vision put defenders in a bind. This is the best offensive player in the league at the moment, and his defense has progressed to the point of deserving MVP honors. All of that said: James looms large. He’s having a better season than most realize, even after accounting for the injuries and sleepy defense. Curry hasn't been this dominant since playing at Davidson. He's my MVP pick because he's simultaneously transformed into the best point guard in the NBA while leading his team to the best record in the league. My four other selections have been the most indispensable players to their teams this season. Harden has become the league's most dominant scorer and Davis is its premier big man. Wall has turned his weaknesses into strengths while propelling the Wizards to new heights and Gasol has made the Grizzlies as gritty of an opponent as ever with a career year. You can give this one out right now. There may not be a player in the history of the award more deserving than Butler. In a leap that recalls Paul George, Butler has morphed from a defensive stopper into a two-way star who will likely command a max contract this summer. The Bulls have spent years searching for a versatile wing who can master Tom Thibodeau’s system but also score alongside Derrick Rose. It turns out the solution was right in front of them. This should be unanimous. 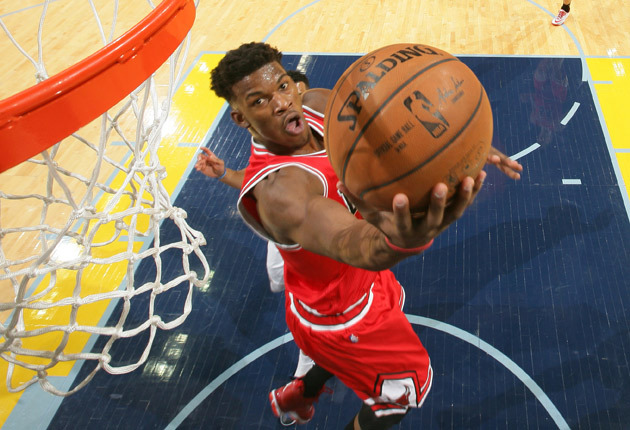 Entering a contract year, Butler has developed into a max-level player. He’s raised his scoring and three-point percentage significantly, restored his field goal percentage level to what it was his first two seasons and defends his position as well as any player in the league, all while being Tom Thibodeau’s workhorse, playing a league-high 39.8 minutes per game. Case closed. Butler’s January slide has made this race significantly more interesting. Still, he’s the leader at the turn, primarily because he’s made a big leap from defense-first role player to lead two-way option for the injury-depleted Bulls. An elite defender and workhorse, Butler has improved as a one-on-one scorer and he’s hit the offensive glass like never before. The fourth-year guard is a shoo-in for his first All-Star team and he’s a no-brainer All-Defensive selection, too. Why not add the Most Improved Player award to his mantle? Green has done it all for the Warriors, but he hasn’t had to bear the same level of offensively responsibility as Butler, thanks to the brilliance of the Splash Brothers. This comes down to Butler and Green, and either is a worthy winner. Both are two-way players, both make teammates better. But, so far, Butler has made the greater leap, and is carrying the larger load. Butler is a player transformed. In a blink he’s become a go-to scorer capable of getting his against top wing defenders, whereas the Butler of a year ago seemed to be a wholly complementary sort. The cutting, curling, defending, and rebounding are all still there. Butler simply rounded out his game with a refined skill that’s difficult to cultivate quickly: shot creation. The Bulls are better for it, even if Butler’s ascent has inflated the price of his upcoming free agency. I'd be lying if I told you I ever thought Jimmy Butler was capable of this, but Draymond Green's rise hasn't surprised me one bit. Green is an incredibly smart and savvy basketball player on both ends, possessing an uncanny combination of touch and toughness. He's averaging nearly eight rebounds per game (listed at a generous 6-foot-7), has already hit more three-pointers than he did all of last season and has become the most versatile player on a team chock-full of them. As for Wall, he might be averaging less points than last season, but he's putting up career-high numbers in assists (NBA-leading 10 per game), steals (2.1), field-goal percentage (45.7) and defensive rating (97.0). The ballyhooed class of 2014 has not lived up to its billing, in large part because so many of the members have been absent. Julius Randle broke his leg on Opening Night. Jabari Parker tore his ACL. Joel Embiid sat out to recover from foot surgery, as did Aaron Gordon. 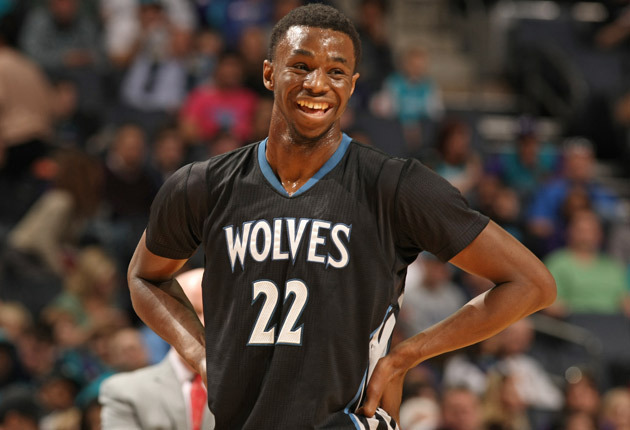 Wiggins stands apart because he played, and after a slow start, flourished. Wiggins remains inconsistent, but he’s put together enough high-scoring performances – 31 at Denver, 27 at Cleveland, 27 against Sacramento – to indicate he is going to be an all-around force. Critics of the Wiggins-Kevin Love swap have to be reveling right now. While it’s too early to declare the Love/Cavaliers marriage a failure, it’s more than fair to declare Wiggins a bona fide rising star. Wiggins offensive numbers have spiked every month -- he’s averaging 20.7 points in January -- and Wolves coach Flip Saunders has forced him to become a reliable defender by handing him the responsibility many nights of defending an opponents top perimeter option. A healthy Jabari Parker would have made this a race; without him, it’s a blowout. The loss of Jabari Parker to a season-ending knee injury took most of the intrigue out of this year’s Rookie of the Year race. Wiggins, the No. 1 overall pick, is actually the only healthy member of the 2014 draft class averaging more than 10 points a game. Much like last year, injuries have decimated the crop of first-year players, with Joel Embiid, Julius Randle, Aaron Gordon and Marcus Smart all missing extended stretches. Even though Minnesota is enduring a nightmare season and the advanced numbers don’t treat Wiggins all that well, his strong recent play (21 points, 5.3 rebounds, 2.9 assists in January) suggests that he will have even more in store down the stretch. This could change by the end of the year. Wiggins has been impressive – moreso than anyone expected at this stage - but one wonders how he would have developed without all the Timberwolves’ injuries. Meanwhile, Noel gets better by the game, and his defensive impact may outweigh Wiggins’ offensive skills by season’s end. Wiggins’ spectacular scoring over the past month gave a clear frontrunner to an award race that previously had none. Still, it’s not too late to shuffle the ballot. A cooldown from Wiggins would again leave this a wide-open discussion, particularly if Mirotic catches a wave of playing time and Payton continues to hit shots. It’s also not too late for Nuggets center Jusuf Nurkic – only recently thrust into the starting lineup – to bully his way into reasonable contention. This was a contest until late December, when Wiggins started realizing the potential he's been teasing for years. Wiggins is averaging 20.7 points while shooting 47.2 percent in January, numbers that aren't befitting of a 19-year-old just getting his feet wet in the league. Just to remind you: Wiggins was born in the same year Kevin Garnett was drafted, but he's growing up quickly with the Wolves. Like with MVP, this could go either way between a Warrior and a Rocket. Howard has regained his rim-protecting form, after two years slowed by back problems, and he is the main reason the Rockets defense has risen so dramatically up the rankings. But the Warriors allow the lowest field goal percentage in the NBA, thanks to Green, who performs virtually every role. He can lock down on the perimeter, bang in the post and provide some rim protection as well. He’s the soul of the league’s best team. If you watch the Warriors, it’s easy to overlook the NBA's best defense and even easier to miss the man most responsible for it. Green isn’t physically imposing, but he can defend multiple positions at the highest level and is clobbering the field in most of the advanced metrics. Green is an incredible weapon for coach Steve Kerr, and when paired with oft-injured center Andrew Bogut, he gives Golden State a championship-level defense. This race is the most difficult to handicap and the field still needs some time to settle. For now, the pick is Duncan, who has guided the Spurs to the league’s sixth-best defense despite injuries to a laundry list of key pieces (Tony Parker, Kawhi Leonard, Tiago Splitter, Patty Mills, Marco Belinelli, and on, and on). What is there to say about Duncan’s defense that hasn’t already been said by his 13 career All-Defensive selections. He protects the paint, blocks shots, clears the glass, rarely fouls and serves as a captain on the court. As for this year specifically, Duncan leads the league in Defensive Real Plus-Minus, he’s No. 2 in Defensive Rating, No. 5 in Defensive Win Shares, and San Antonio’s defensive rating improves from 101.5 when he’s on the bench to 98.4 when he’s on the court. This is a tough one. Part of the reason Green is so effective is because of the Warriors’ overall defense, so this is a bit of a team award. Regardless, he is a unique defensive player, able to switch off a power forward and onto a point guard, and he absolutely hates being scored on, the most important trait in a defender. Davis is more formidable, Duncan remains the most important to his team, but let’s give this one to the guy we all wish played on our pickup team. The midseason field for this particular award is complicated by 1) the injury-abbreviated stints of a few top defenders, and 2) relative team underperformance for some otherwise impressive candidates. Green sidesteps both of these concerns. The sophomore forward is as versatile a defender as you’ll find, capable of handling matchups across all positions. He doesn’t just make the best defense in the league better. His skill and flexibility are the tactical centerpieces of all the Warriors do. As much as I want to give this award to Anthony Davis, I can't hand it over with good conscience knowing the Pelicans rank in the bottom third of the league in defensive rating. Instead, I'm giving my second piece of hardware to Draymond Green, who has emerged as the most versatile defender in the league. How many players can competently guard LeBron James, Kevin Durant and Blake Griffin? If you were playing poker and 2's were wild, the 2's would be Draymond Green. Steve Kerr can insert him into any five-man lineup -- and put him anywhere in it -- knowing he's improving his hand. Voting for Crawford has become habit, but he’s more important than ever, because the rest of the Clippers bench is so ineffective. Outside of Crawford, their highest-producing reserve is Spencer Hawes, at 6.1 points per game. Crawford contributes more than twice as many points, carrying a meager second unit, and keeping the Clippers in games that Chris Paul and Blake Griffin can close. 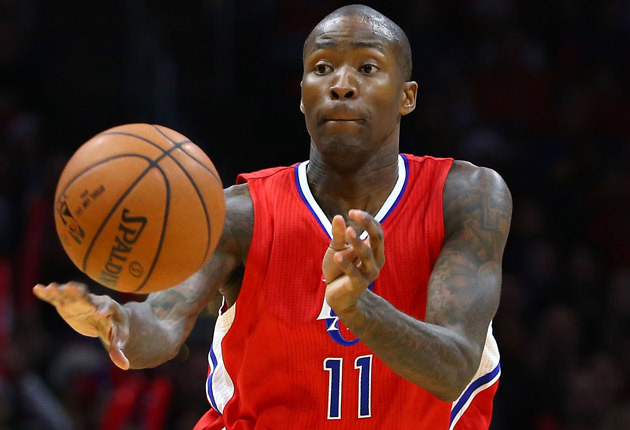 The Clips lack depth this season, but they’re still 28-14, with Crawford masking a weak spot. This is a razor thin race between Williams, the Raptors sparkplug who GM Masai Ujiri swiped for next to nothing last summer, and Speights, who is putting up some tidy numbers in fewer minutes per game. For now -- and the emphasis is on now -- give the nod to Williams, who has shaken off any lingering effects from ACL surgery and energized the Toronto bench. The 27-year-old Speights could be thrown into the Most Improved Player discussion as well. The Sixth Man tag might fit a little better, though, because he does such a nice job of maintaining the incredible momentum generated by Golden State’s outrageously talented starting five. Speights is averaging a career-high 12.6 points and 5.1 rebounds, and his strength has presented real problems for second-unit defenders. Acquired on a bargain basement contract ($11 million over three years) in 2013, Speights has outperformed those terms many times over this season, especially when briefly called into a starting role due to an Andrew Bogut injury. Speights is capable of going off for 20+ points against the right matchup, something you don’t often see from reserve big men. His +10.7 net rating actually tops Ginobili’s (barely), a fact that helps speak to the depth of his impact on Golden State’s strong start. Going all in on the Warriors here. Unlikely Speights keeps this up, but he’s been shockingly important to the Warriors’ success, allowing the team to go with up to three and sometimes four defensive specialists alongside him on the second unit. It’s shocking that Speights is even in this conversation given the player he was a year ago. At that point he was nothing more than a big body with a tendency to hoist up jumpers indiscriminately. Now, Speights eclipses the per-minute scoring of the NBA’s other top spark plugs, contributes to the league’s top defense, and hits from mid-range at an absurd clip. That he brings those qualifications as a rotation-caliber center makes him especially valuable, edging out a compelling runner-up in Williams. Also: A vote for Gobert is no nod to novelty. Few players in the league can claim the same level of defensive influence, particularly around the rim. It's pretty incredible that Speights has emerged as the best bench player on the Warriors considering they also bring Andre Iguodala and David Lee off the pine, but that's the reality in Golden State. Speights' 24.3 points per 36 minutes are second only to Stephen Curry (tied with Klay Thompson) and he's scoring with stunning efficiency, shooting 52 percent from the field and 81 percent from the stripe. We also shouldn't overlook that the fun-loving big man appears to also be a positive locker room presence, bringing smiles to teammates with the team's unofficial anthem (which has since been retired). I'm in love with the MoMo. In any normal season, Kerr would be running away with this award. He took over the No. 6 team in the West, it made no major roster upgrades, and suddenly became the best squad in the NBA. But this is not a normal season, because the Hawks have followed an even more alarming trajectory, hurtling from eighth in the east all the way to the top. Kerr inherited loads of talent, while Budenholzer has maximized players often taken for granted, turning Jeff Teague and Paul Millsap, Al Horford and Kyle Korver into title contenders. The second tier is loaded with candidates: Kerr, who has helped the Warriors advance from playoff contenders to title ones; Joerger, who navigated an ugly offseason to push Memphis towards the top of the Western Conference standings; Terry Stotts, who has done an excellent job melding the talent in Portland. But the first tier is occupied by Budenholzer, the longtime Spurs assistant who has developed Atlanta into a pass-happy, defensive-minded, sharp shooting unit that would make Gregg Popovich proud. Don’t vote for Budenholzer? Give your vote back. 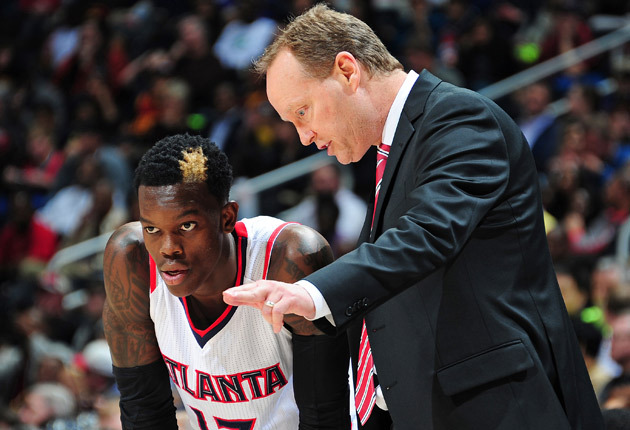 A coach’s primary job is to get the most out of the talent at his disposal, making Budenholzer the clear choice. Without a “name” superstar, the second-year head coach has guided Atlanta to the league’s most wins, the second-best record, the fifth-best defense and the sixth-best offense. Budenholzer has overseen Jeff Teague’s growth into a top-shelf point guard, Kyle Korver’s full emergence as an historic outside threat, and strong two-way play from the league’s most underrated frontcourt duo, Al Horford and Paul Millsap. He’s done all this despite an ugly summer of infighting, an exiled GM, a heretofore apathetic fan base, and a possible ownership change. Remarkable doesn’t even begin to describe the work he’s done. I’m biased here (Mike and I were college teammates at Pomona) but that doesn’t change the fact that Budenholzer is the easy pick. The Hawks are the first half story in the league, and the team’s offense is gorgeous. It’s always nice when the easiest choice on the board is also the best. This award often goes to the coach at the helm of the league’s most surprising team. The Hawks are certainly that. They’re also organized by Budenholzer as to maximize their smarts and talent, yielding 28 wins in Atlanta’s last 30 games. Budenholzer’s system has turned the Hawks into the most beautiful offensive outfit working, and his principles have stabilized Atlanta’s defense in the top five. 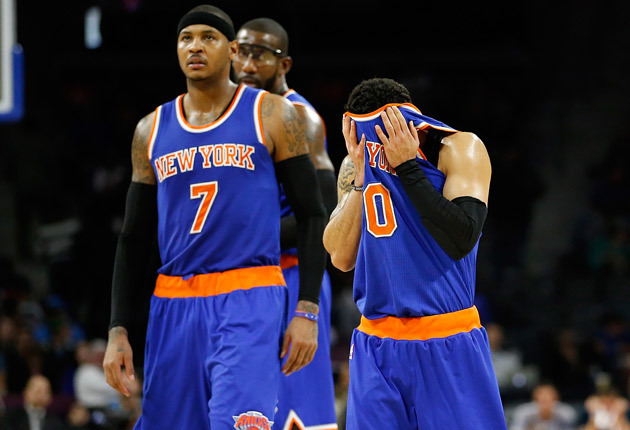 None have fared better in the first half of this NBA season. What Budenholzer has done with the Hawks is nothing short of incredible, but Kerr's performance in his rookie coaching season -- on any level -- eclipses the Hawks' leader. Kerr has led the Warriors to the seventh-best record in NBA history through 40 games, a feat that becomes even more amazing when you consider he was this close to coaching the Knicks this season. Instead, he's led Golden State to the best record in the NBA, atop the ultra-competitive West, and fortified the team's defense, which ranks No. 1 in the league. Not bad for a guy who was sitting next to Marv Albert last season. Jenkins: Thunder-Cavaliers. I went with Oklahoma City-Cleveland in October, and as horrible as that looks right now, and as wonderful as Golden State-Atlanta appears instead, it is a long season and I will stand pat. Mannix: Spurs-Hawks. Repeat after me: Do not bet against San Antonio. Do not bet against San Antonio. Ballard: Warriors-Wizards. These kinds of predictions are always a shot in the dark, as so much depends on injuries, seeding (in the West) and matchups. But both Washington and Golden State possess the offense, defense and playmakers to go deep. • MORE NBA: Will Kobe become NBA's next great media personality? 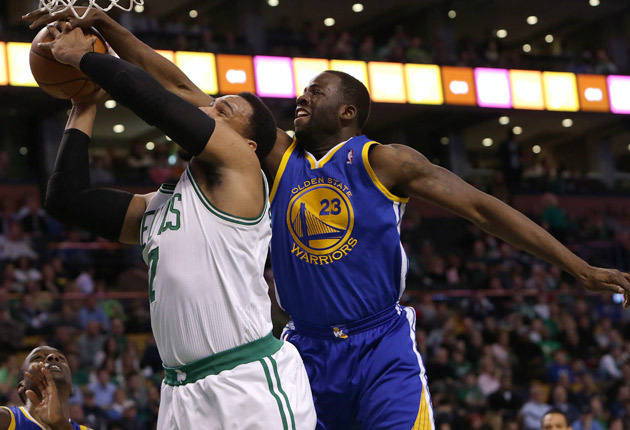 Dollinger: Warriors-Bulls. This is half-prediction, half-wish. For all of the contenders in the NBA -- and there sure are a lot of them this year -- these two teams are the most finished products. They possess immaculate starting units and deep benches; a host of lineup possibilities and strong defenses; competent offenses, plenty of star power and two of the best coaches in the league. If there's a dream Finals matchup midway through this season, it's this one. Although it would be pretty ironic for the Cavaliers and Thunder to make the Finals after a drama-filled regular-season. Jenkins: Thunder and Cavaliers. The ones mentioned above, and not because of Dion Waiters and J.R. Smith. When healthy, Kevin Durant and LeBron James are capable of remarkable runs. Ballard: Cavaliers. Unless LeBron is injured worse than we know, there’s no way he wastes a season. He’s too good, and the East is too weak. You can throw the Thunder in here too, for obvious reasons. Mahoney: Spurs. As it turns out, health matters. The Spurs have had some odd moments and uncharacteristic losses this season, but the data is fairly conclusive: When Kawhi Leonard plays, this is still an excellent team. Dollinger: Suns. After narrowly missing the playoffs last season, Phoenix won't suffer the same painful fate this year. The Suns have won eight of their last 10 and have added the necessary fire power (Isaiah Thomas) and rim protector (Brandan Wright) to make them a formidable threat in the West. If Phoenix comes through in the second half, it'll likely mean a playoff-less spring for Durant and Co.
Jenkins: Over. The bottom of the East is bad and the race to the cellar will be fierce. They’ll stumble into 10. Mannix: Over. They play in the East. Too many teams want to lose as much as they do. Ballard: Ten games sounds about right. Mahoney: Over. Never underestimate the bedlam of early April basketball and what it can do for the win total of a crummy team. Dollinger: Over. BARELY. If it wasn't for the fact that New York has rattled off back-to-back wins I would have mulled this decision like LeBron. If the team elects to shut down Carmelo Anthony at some point -- and maybe it should if it keeps winning -- it'll be close. Remember, this is a team that's starting Lou Amundson and Langston Galloway. Anything is possible. Jenkins: Brook Lopez. When the Nets-Thunder deal fell apart, it wasn’t that the Nets decided they wanted to keep Lopez. They are just waiting for a better offer. Mannix: Wilson Chandler. The Nuggets forward is a hot commodity for teams looking for depth at the wing position. Rebuilding Denver may be motivated to deal him to the highest bidder. Ballard: Brook Lopez. It just makes sense. Dollinger: David West. Indiana has been holding on to faint playoff hopes because of how weak the East is, but if the team slides in the second half it might be time to unload its veteran leader. The last thing the Pacers need are meaningless wins in March and April that hurt their draft positioning, and it would be nice to see West suit up for a playoff team this spring. Jenkins: Charlotte, with Al Jefferson back, will sneak all the way to No. 6 in the East. Ballard: Kobe goes off at the All-Star game. At this point, it’s the most meaningful game remaining for him this season and, realistically, it could be the biggest game left in his career, which is weird and sad to think and I hope isn’t the case. Either way, expect a show. Dollinger: A No. 1 seed will lose in the first round of the playoffs. With the West insanely competitive -- and the East too jumbled to figure out -- we could see a regular-season powerhouse go down early this postseason.